We have all been told you can’t judge a book by its cover and the same can be said for the new Bobcat E35 compact excavator. With power and performance well above its weight, this nimble machine will power through job sites with limited space available. The combination of the zero tail swing improved engine, hydraulic horsepower and increased operator space and comfort will make this machine a clear favourite of operators around the globe. As an operator in the cab 8-12 hours a day you are looking to remove those distractions or dislikes in a machine to allow you to properly focus on your job at hand, the machine and the potential risks that exist in and around your machine and work site. As every operator knows it only takes a momentary distraction for a disaster to unfold. This is what has been addressed in the E35. Bobcat Company has taken a refreshing look at solving all known issues, going to the coal face to do so. Based straight off the feedback from operators around the globe (including Australia), Bobcat has supersized pretty much everything in the E35; well everything except the weight that is. 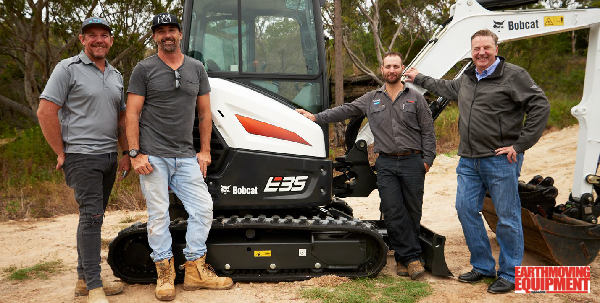 Keeping operators comfortable and happy has been high on the agenda for Bobcat with not only a larger, roomier cab, but a wider seat, more legroom and climate control. The fingertip-controlled boom offset has created great control and also freed up extra legroom on the floor of the cab. The tracks run smoothly with less vibration and generally the machine runs extremely quietly in the cab at 77DBA. Bobcat will make a lot of operators very comfortable working out of this machine and above all reduce distractions and the potential for operator error. Operator comfort isn’t just about being comfortable when working. It’s about providing a distraction-free environment where all the operator is left to focus on is the tasks in front of him or her. With distractions come reductions in safety and concentration. The E35 has no such problems. In fact, I would go as far as saying it’s one of the roomiest and comfortable excavators for its size I have operated. Firstly, it tracked exceptionally well with a comfortable ride and reduced vibration through the tracks and into the cab. Secondly, as much as the performance has obviously increased, it is quieter in the cab than other excavators I have operated of the same size. The seat itself is broader, as is the cab and for a bigger guy like myself the extra legroom is appreciated. I can’t say enough about the amount of thought that has gone into the cab. Visibility from the chair is fantastic with a 15 per cent increase in glass area, which creates a safer work environment for everyone. Regardless of the bitter winter cold in Victoria or Tasmania or the searing summer heat of North Queensland or the NT, the climate control will keep the operators at the perfect temp to get the job done well in great time. Added performance is key to improving the efficiencies of any machine. As the horsepower increases so does the machine’s ability to work with both precision and power on even the most demanding job sites. Weighing in at 3349kg, producing 23.1kW and with a bucket digging force of 31,500N, the E35 has plenty where it counts and is capable of tasks well above its weight. Its improved stability has brought a 15 per cent increase in over the side capacity. The downward positioning of the blade has also been increased for added digging stability. made extremely easy with class-leading serviceability. This ease of access will save time and money over the life of the machine. The E35 performed extremely well in all the situations we put it in – we lifted and moved large rocks and dug trenches with ease. It really does have tremendous digging and lifting capabilities. Bobcat has evolved its hydraulics over time to arrive at the impressive system it has in place today. The high-efficiency, torque-limiting piston pumps match force on demand continuously responding to loads and delivering more usable power. The more horsepower delivered the more hydraulic power available to lift, dig and load. This combined with Bobcat’s industry leading cycle times provides the efficiencies and precision that Bobcat is now renowned for. The Bobcat E35 has impressed me on several levels. It is small enough to get into tight areas and powerful enough to smash through an impressive amount of work. It performs above its weight and I can see this machine making some operators and bosses very happy with both its comfort and performance. It moved along the ground very well and with the auto shift feature activated the machine shifts out of high range and back, which automatically increases travel performance on demand. The fingertip boom swing control provides fast and accurate control with next to no fatigue due to the fine and smooth movement of the controls. The auto idle feature cleverly kicks in when the machine has not been used for four seconds, which lowers noise and fuel costs. As soon as any input is given to the machine, it returns to the previously set throttle position. Whether you’re a builder looking to scale up your operations, a commercial landscaper keen to take on more significant projects, or any contractor or business that has an ongoing need to dig in areas of limited size, this machine will not disappoint. With a punch way above its weight, the Bobcat E35 Compact Excavator is one tough animal. View the Bobcat R-Series E35 Compact Excavator here or Contact us for a quote!